Day 1. May 8, 2013. Paris to Massy. 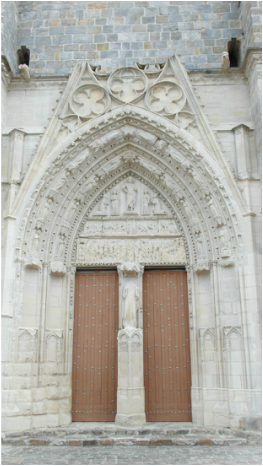 Dedicated in 1414, l'Eglise Saint-Jacques-de-la-Boucherie stood for many centuries on the bank of the Seine, not far from la Cathedrale de Notre Dame. Pilgrims from all over Europe would assemble at the church before continuing their journey to Santiago. The church was reputed to host a finger, a tooth and a rib of the saint himself, but all that remains today is the tower. It was here that I began my walk under an overcast sky with intermittent rain -- gloomy weather after the sunshine we have been enjoying at home. It was a glorious morning as we drove out to the airport in Victoria: a little hazy, cool, but with a promise of summer warmth later on, and yet another fine day in a long string of them. What a paradise we live in! Did I really hear someone complain about the heat? Surprisingly, the flight from Victoria to Calgary was in a propeller plane, a blessing as it turned out, as the drone of the propeller drowned out the drone of the passenger behind, who began his nonstop monologue the moment he sat down. A double blessing, because we flew lower than usual, and enjoyed a spectacular view of the mountains. But the sky turned hazy as we crossed into Alberta, probably from the smog of the tar sands. Everybody has his own list of the passengers from hell that he is sometimes unfortunate enough to be seated beside or near. Mine includes the aforementioned drone, who is especially annoying when you've been looking forward to a quiet meditation or read. You can sometimes escape by feigning sleep. Then there's the person who falls asleep beside you then lolls over into your space. I had one of those on the fight from Montreal to Paris. I was also unlucky enough to sit in front of a kicker. Not only a kicker, but a wrencher, who would haul himself up by grabbing the top of my seat. And then there's the crying baby. My ailing ears can no longer distinguish words clearly, and almost missed the last call for my flight from Victoria to Calgary, but they are still susceptible to the piercing shriek of a baby in distress. Not much you can do about that either, except empathize and remember when you were the unfortunate parent, and determine to bring earplugs next time. As a child I would travel by train from York to Perth, and the clickety clack of the wheels on the rails would transform itself into songs in my head. They were probably the early cowboy songs of Slim Dusty, who later became famous for "The Pub with No Beer". But on the flight across Canada, the dull grey sound of the aeroplane in flight gave rise to melodies from the previous night's concert, particularly the haunting themes of Steve Dobrogosz. I have often noticed how the broad rush of air and motor provides a harmony to whatever song comes out of the ether. I have written before of the days when the booze flowed freely on Flight 870 from Montreal to Paris. Last year I managed to cajole a reluctant brandy out of the flight attendant. Not this year, I'm afraid. "Those days are gone," she said. There was not even a second glass of red, so I arrived in Paris in pretty good shape. It's strange how you seem to have more octogenarian friends as you get older. In Paris, at the foot of the Tour de Saint-Jacques, where my walk began, I met my old Aussie mate, George, and his charming wife, Josephine. George is a wiry bugger, still much fitter than I am. His eighty years hang lightly upon him. After walking the Camino with me more than ten years ago, he went back to Oz to ride his bike across New South Wales. Now he limits himself to twenty-mile circuits around the Swan Estuary. George is searching for the meaning of life, and when he finds it, he's going to tell me. I am his Telemachus. Josephine complements him. He is down to earth and yet whimsical; she is kind, ironic and intellectual, and would have been a fitting narrator for a Jane Austen novel. Or perhaps one by George Eliot. We enjoyed a coffee in a congenial cafe beside the tower and then I was off. Meeting them was the highlight of the day. After that, and a brief pause on the bridge for a photo of the always-beautiful Seine with the Eiffel Tower in the distance, I strode rapidly towards the outskirts of Paris, along the Boulevards Saint-Jacques, General Leclerc and Aristide Briand, crossing the Boulevarde Periferique at the Porte d'Orleans. I sought refuge from the rain in a Baptist Church where I was received most hospitably. The last time I was in a Baptist Church, 30 years ago, I was horrified to be hugged. What is Christianity coming to, I thought. Later in the afternoon I saw the familiar red and white stripes in front of a wisteria vine, but there was no grande randonnee to be seen. A promise of things to come, perhaps. Tonight, in Massy, as I look out my window, I see, not Roman ruins, a cathedral, or green fields, but an ugly square with tall narrow apartment buildings on one side and long, low, flat-roofed bars and restaurants on the other. Tomorrow, I will not tarry, but hasten to get out of the city. At breakfast I sat opposite a grim-faced French family. He had a dark look. She had a dark look. Each of the boys had a dark look; in fact one of them had a very dark look which got even darker after a clip on the ears for making a mess at the table. He was incessantly tapping his fingers. I was glad that he wasn't in my class this morning. He would have brought a lot of anger to school with him. Then the parents went outside to have a smoke and the kids ran around in the car park. I began sluggishly. After my customary beer on arrival yesterday afternoon, I fell asleep at the bar, and that must have upset my efforts to avoid jet lag, for I awoke at half past three in the morning and couldn't get back to sleep. Usually, on a sleepless night, I fall into deep slumber just before the alarm bell rings, but last night I didn't even enjoy that brief moment of repose before getting up. So this morning, I did not leave carelessly. Then I enjoyed my first glimpse of the countryside. A bunny scampered away as I approached. I noticed a horse and cow sleeping side by side in the sun and the birds were singing softly. I have left behind the continuous stretch of housing and commerce that extends out from the centre of Paris. The capital, of course, was always encircled by villages, and as the population expanded they were eventually engulfed by modern development. Farther out, where I walked today, a little of the surrounding countryside, but not much, has survived. Tomorrow I hope to be en pleine campagne. They have no time to waste. 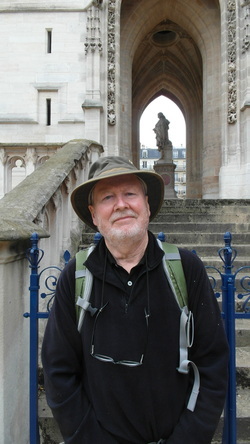 Now people are starting to recognize that I am walking the Compostelle and they point the way. Or they stop and talk. I met one fellow with a friendly dog, and we chatted for a while. In his youth, he had hitch-hiked around Britain, and the locals had been very kind to him there and showed him the way. That's why he was showing me the places to visit, he said. I suspect he had told this story before. Eventually, I had to make an excuse to get away, as he kept flipping through my guide and finding something else I mustn't miss. That was the only friendly dog I encountered. The rest would bark and run up against their wall to have a piece of me. And then I passed an industrial site "securise par les maitres chiens". It sounded like a master race of dogs that none of the others would dare to mess with. As I flew across the Atlantic two days ago, it was the themes from the modern compositions we had sung in our recent concert that came into my head. Now it was the Haydn that wouldn't leave me alone. As I trudged up the hills today, I found myself singing, "De-pre-cat-ti-o-nem no-o-stram, De-pre-cat-ti-o-nem no-o-stram, De-pre-cat-ti-o-nem no-o-stram" with five steps in between each repetition. As each "nostram" ascended, so did I, and then, Sisyphus-like, I would have to begin again for I had not yet reached the top. In the afternoon, I passed beneath le tour de Montlhery, vestige of a medieval chateau, and used in more recent times in experiments to determine the speed of both light and sound. I was not travelling at the speed of either, and I hadn't booked any accommodation, so I didn't make a detour to visit the tower but pressed on to Arpajon. I walked 26 kms today, according to my GPS watch, two more than I should have done. The guide sometimes leaves out details that can be very important. A word about gadgets. This is a little embarrassing. On my first long distance walk, apart from a camera, I didn't carry a single gadget. Today, I carry an iPhone to receive data from the internet, a French pay-as-you-go to book ahead and receive telephone calls, an iPad mini to write and post to this blog, and a GPS watch to track my daily progress. And as accessories to all of these, six cords, two chargers, and two adapters. A pound of flex! The joys of the simple life. Day 3, May 10. 2013. Arpajon to Etampes. Arpajon is famous for its halle, a wooden, barn-like structure, built to house a market. The halle d' Arpajon was erected in 1470. At half past seven this morning, when I went looking for a coffee, the merchants were already setting up for the Friday market. I drank my coffee and left. It took some time to reach the outskirts of town, and after some fumblings and bumblings (the tumblings came later) in the village of Egly, I reached the wide open countryside. I felt the full force of the wind that was tearing to shreds the rags of the four scarecrows guarding the empty field. Then, at Boissy-sous-Saint-Yon, I visited the Eglise Saint-Thomas a Becket, listed on the inventory of historic monuments for its famous alabaster bas-relief of that "cursed priest" dispatched by ambitious knights to please their king. At the next village I took advantage of the shelter in l'Eglise Saint-Sulpice to eat my demi-baguette. This massive church, with its flying buttresses and gargoyles reaching out with open mouths like thirsty sinners in the flames of Hell, is another example of a huge church in a small village, a sign of past piety or wealth. The portail is very fine with only the head of the Virgin lopped off by zealous Protestants. Of course, it was really ignorance and guilt and fear as much as piety that motivated the alabaster sculpture or the ornate church. There was no connection between Thomas a Becket and Boissy-sous-Saint-Yon, and there was no need for such a big church at the little village of Saint-Sulpice-de-Favieres, but if the the villagers were human like the rest of us, and the priests told them that they were going to roast in the flames of hell if they didn't do their bit for the glory of God, and they weren't able to reason otherwise, then what else could they do? Today the Taliban lop off the heads of Buddhist statues and other ignorant people seek salvation in their own way, at the expense of others. In front of the door I met a rambler, who suggested that I take the road into Etampes and avoid the exposure to the wind as I walked across the plain. Oh that I had! I wouldn't have taken a wrong turn later on. But the wind had died down as I walked across the open fields, and I made good progress. Later, I took a little tumble as I scrambled down a rocky path in the forest. Nothing serious. It was at Brieres les Scelles that I somehow missed a turning and walked unnecessary kilometres. I followed the advice of a friendly barman rather than retrace my steps. He spoke in broken English, either for his own pleasure or to avoid the pain of my French. I always wonder at the motivation when that happens. Is my French worse than their English? Eventually, I arrived at the outskirts of Etampes and walked for a couple of kilometres along a very fine bike path. But I didn't have to dodge any bikes. There weren't any. Come to think of it, I haven't seen any bikes on the many paths I have seen since leaving Paris. I am staying tonight at the Presbytery, accommodation more humble than last night's hotel, but a lot cheaper. In any case, a dorm when one is alone is like a private room. But it's cold. And there's a notice warning of the high cost of gas. But I've turned the heat up anyway. Why can't the Church harness the flames of hell to heat their presbyteries? Day 4. May 11, 2013. Etampes to Angerville. It was drizzling as I was about to leave Etampes, so I took off my boots, put on my clammies, put my boots back on, and set off. The rain stopped. On the way out, I passed two or three dozen men fishing with their rods in what seemed to be a ditch, but turned out to be a narrow river, two or three yards across at most. They were fishing for trout. The fish weren't exactly leaping onto their lines, but a fellow downstream was supposed to have caught one. I've never understood the attraction of fishing, especially when you stand for hours on a river bank or jetty or bridge without catching anything, and have to throw it back if you do. That's incompleat angling! I feel sorry for the fish. How would you like a hook through your gob? And just when your wound heals, you get another one. I'd rather be cooked and eaten. And I don't think I've ever seen a fisherwoman. Women have more sense. I suppose that these men learned at their fathers' knees that standing for hours in the rain without catching anything was the right and proper thing to do. I took the main road out of town, climbed steadily up an old Roman road onto the high prairies, and then walked through fields of wheat and canola. And then a field of newly planted peas. Once I was lucky enough to come upon a crop that was ripe, so I helped myself. I ate as I walked. It was a moveable feast. I marched for several mille passuum in a straight line along the road that the legions must have followed as they went out to fight the Gauls. What long strides their soldiers must have had! Precisely 1.76 yards? What if you had short legs? How could you keep up? I arrived at Saclas, then walked along the highway to Guillerval. I ate my demi-baguette on a bench beside the squat little church. In the photo, you can just make out the bench where I was sitting. As I left the village, I passed by what could only be described as a bicycle garden. Rusty bikes and an old carriage were planted along with tulips in a piece of stony ground. I know what my old mate Patrick the Belge would have said. You'll have to go back to Day 5 on the Road from Vezelay to find out. I walked once more across the fields into a strong, cold wind. Soon I was reassured to see a church steeple and a chateau d'eau in the distance. 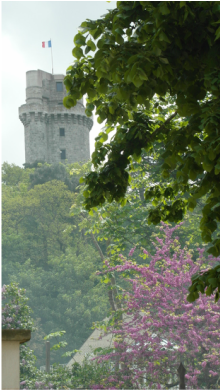 Apart from the church, the chateau d'eau or water tower is the most common landmark mentioned in the guidebooks. It is comforting indeed when I read "chateau d'eau visible on the horizon", and then it appears. I know I'm on the right road. I noticed a patch of broom to one side, without a heavily armed troop of volunteers trying to root out the foreign invader. To the west, I could see a line of wind turbines, eolienne harps with a harsh music of their own. A hare as big as a kangaroo bounded across the road in front of me at the speed of a TGV. Just before Monnerville, I heard a familiar sound above my head. I looked up and there they were, fluttering and trilling away in the clouds, as happy as -- larks. My heart leapt up. I was reminded of a quotation I had seen last year. I found a bar in Monnerville and had a large coffee. I asked about a short cut, for the last step followed two sides of an isosceles triangle, the hypotenuse already taken by an autoroute. But there was none. She said I wasn't the first person to ask. Off again, first to the south, then to the west, where the wind was now so strong it was slowing me down. I literally pushed on into Angerville, hungry and tired. The priest received me hospitably at the presbytery. Very comfortable, I thought as I looked around. Then he took me out to my digs, a tiny bed in the corner of a large church hall. Another grande chambre! He showed me his church, and two tall pine trees that had been standing up against the back wall for 200 years. These I found more impressive than the church itself. When I asked, he told me that he had a congregation of 200 people. "That's a lot," I said. "It must be due to your homilies." For once, my pleasantry didn't fall flat. There were tiny little ants running around on the floor of the church hall where I had spent the night. Perhaps they were Argentine ants. They didn't smell. When I was a child, Perth experienced an invasion of Argentine ants. My father taught me always to squash an ant to see if it smelled. If if did, it was all right, it wasn't an Argentine ant. I'm not sure why they were such a threat. Perhaps they would eat us out of house and home. An even greater threat was the white ant, the termite. It would eat your house and home. When I was young, back in Oz, if someone stole your girlfriend, you were said to have been white-anted. An effective metaphor, if you think about it. When I left town this morning into a cold breeze, the temperature was eight degrees. Winnipeggers, always eager to make it colder than it really is, would have said it was minus ten with the windchill factor. Or, "It's minus ten, (pause, and then), with the windchill factor." Or, "It's minus ten." Stop. 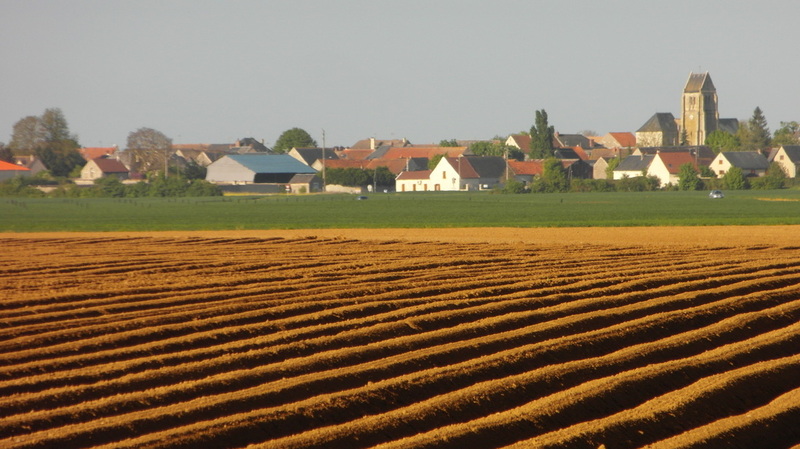 As I walked out, the sun was lighting the furrows of a newly ploughed field. I arrived at the little hamlet of Ouestreville. I chuckled at the notice next to the gate of someone who obviously didn't like dogs. I thought about what I would like to do in the dead of night. But I had to move on. I mean, how absurd! A dog's gotta go when a dog's gotta go, and a dog's gotta go where a dog's gotta go. I passed between a battalion of wind turbines and a line of high tension towers. Triffids and tripods about to do battle. The larks began to sing again. They must have sounded bittersweet to the soldiers on the great battlefields to the north. When they could hear them! Nightly she sings on yon pomegranate tree. Do lace the severing clouds in yonder east. The nightingale is the other bird I long to hear, but it may be too late in the season. I did hear one once on the Chemin du Puy. The villagers of Oinville-Saint-Liphard seemed to have surrendered to the triffids, for the turbines were planted in their midst. It was probably a way of paying the bills. Most little villages I pass through can afford to open their mairie for only a few hours each week. And of course, the commerce has all gone. When I arrived in Toury around lunchtime, anxious for my first coffee of the day, I found a market in full swing in the centre of town, and I couldn't even squeeze inside a nearby bar. I found another down the street on the corner of the road that leads to the railway station. I mention the location only because I was received most hospitably, and was able to take advantage of their Wifi. After trekking another five or six kilometres and reaching the village of Tivernon, I was ready to sit down on a bench in front of the church. But as my old friend Rod Halcombe's father used to say on the ABC's Sporting Roundup when Claremont had been expected to win the footy, "Such was not to be the case." There was a bench, but no boards! Were they trying to discourage a sedentary life style? I walked a little further and came to another bench. This time there was one plank, out of three, and no back. The others must have been taken by someone as thick as two planks. Why the boards had been removed from the benches in this village must remain to me one of life's little mysteries. As I neared Artenay, I came upon a twentieth century folly, the aero train line. In Victoria BC, we make fun of the bridge to nowhere, an overpass abandoned when the developer ran out of money. In front of me was an 18-kilometre viaduct to nowhere, a track on concrete pillars built in 1969 to test a magnetic levitation train, and eventually to carry a fast service between Paris and Orleans. It was abandoned when funds ran out and the TGV became the accepted model. But the track remains, and will probably remain for a thousand years, since nobody has the money to pull it down. Something for future historians and archaeologists to talk about! The hotels in Artenay were closed, but I found a thriving motel up on the highway. It was cheap and comfortable. Now I didn't get lost today. Well, perhaps I missed the odd turn and put on an extra few metres here and there, half a kilometre in all at most. But I walked 38.5 kms, instead of an expected 30.5. Were the authors of the guide measuring as the crow flies and not as the pilgrim walks? But tomorrow, it's a short walk into Orleans. I hope. Hail, Poetry, thou heaven-born maid! I pushed my way against the wind, as occasional showers of rain pattered against my Patagonia jacket. I was spending much of the day going back and forth under the Great Viaduct or over the motorway, or both. Trains whizzed by on the Paris-Orleans main line. On the way to Chevilly, I witnessed what I thought was the cruellest thing I had ever seen. A movement in the middle of field to the left caught my eye. A large bird, some kind of hawk, was tethered to a pole, and was swooping and soaring as it tried to escape. This brutal treatment of an animal made the force feeding of birds to fatten their liver for pâté seem like the milk of human kindness. I watched it for a while, and then noticed the legs. It's not a bird, it's a bat, I thought. And then I twigged. It was not a living creature at all. It was a kite, and the most effective scarecrow I have ever seen. It had me fooled, and surely I am brighter than a crow? And yet, even the dumbest crow must have wondered after a while why the big fierce bird didn't do anything, but just kept on making threatening gestures. I sometimes feel a bit of a fraud as I walk on a "pilgrimage", especially when I find myself at an Accueil Pelerin and I'm assumed to be "pratiquant". The other morning, for example, just as I was going out to have breakfast, some young priests arrived and invited me to pray with them and then join them afterwards for their meal. I had to refuse, of course, and my refusal was graciously accepted. It was a kind and Christian offer that would have been gladly accepted by a religious pilgrim. I told myself that there are many kinds of pilgrims, and that Christian hospitality extends to all kinds. I have always found that to be the case. In the spirit of the Camino, I thought I would offer you the occasional religious reflection or even my attempt at a Profound Thought. Am I a Christian? I certainly don't believe in the divinity of Christ or anything that follows, such as the virgin birth or the resurrection. To my mind, these are all later political attributions to a simple and exceptional man. And I certainly don't believe in a benevolent God. That much is obvious. The apologists have tied themselves into knots of logical absurdity trying to explain away the problem of suffering in the world, the injustice of it all! God is punishing the sinners? God works in mysterious ways? What a lot of nonsense! And yet, I don't like the way the pendulum has swung in the opposite direction. It has become fashionable to knock Christianity. The great atheist, Richard Dawkins (some would say the great Satan), has called himself a cultural Anglican. That's where I fall as well. In fact, like it or not, that's where most of us lie. Especially if we love art and music and poetry, and feel a part of the great tradition. So I am a cultural Christian. I love churches, unless they are glass temples. We take them for granted, even if we don't go inside them. Imagine what it would do to the character and beauty of our towns if the churches were pulled down. What would we see in their place? Golden arches? Or worse? I love the language of Christianity, and I hate to see it dumbed down. I love the King James Bible and the Book of Common Prayer. And I love the Latin mass. I love the hymns, and had occasion to sing some of them recently when I attended the funeral of a former colleague. John had planned his own service, and against the wishes of his church, had insisted on the congregation's singing the words of the hymns before they were neutered. I sang with gusto "Praise my soul the King of heaven", or was it "Praise to the Lord the Almighty the King of Creation". I forget which, but both are rich in masculine nouns and pronouns. Who art within us and about us, but certainly not up there. And we may or may not believe in thy divinity. But do not expect us to ask for our trespasses to be forgiven, for sin is the artificial construct of a colonial and patriarchal society. Nor do we ask to be delivered from evil, for there are no absolutes. And may it always be green, even as we enjoy the fruits of its destruction. I have used as few capital letters as possible, because I have heard that they are offensive to some people, but I don't know why and I don't know whom. It was a fine service, and, as we would have expected, full of great music from Mendelssohn to Gilbert and Sullivan. John was a fine man, and left a large legacy. I, for one, owe him a lot, for he invited me to join the Manitoba Opera Chorus for the singing of Aida. I was flattered, for I didn't read music. It was only later that I realized that if you sang tenor the conductor didn't ask awkward questions. I was thinking of you today, John, as I walked across the plains. At Gidy I received a nasty shock. I had lingered a little this morning, thinking it was only 17 kms to Orleans. I had already walked 15, so I stopped for a coffee and a crust of bread. How far to Orleans?" I asked. " Sixteen, replied the seasoned veteran at the bar. Sixteen?? I looked at my guidebook and saw that the distance to be covered was not 17, but 27, kilometres. I had been misled by the author's assurance that today was an easy day. I looked at his photo on the back cover, and saw the physique of a marathon runner and the physiognomy of a sergeant-major. I trudged on. Finally, I reached the outskirts of the city of Joan of Arc, the maid of Orleans. I walked into the old town, and found the Hotel du Sauvage, which the girl at the tourist bureau had described as "sympa". And it was, if only because of the largest beam I have ever seen, spanning the top of my room and supporting the rafters above. Tomorrow, I am going to spend the day in Orleans. I hope to regale you with some pictures. And on the seventh day thou shalt rest. I ate a reasonably priced breakfast at the hotel, or rather the superior hotel across the courtyard, with coffee made by a person and not the machine which is becoming more common in cheap hotels. I should explain that when I asked if my hotel had Wifi, I was told, no, but the hotel across the way did, and for 10 euros more I could stay there. Or I could have the code and stay here and use theirs. Which I did. My hotel sits on la rue de Bourgogne, an ancient Roman road that stretched between Burgundy and Chateaudun. In medieval times it separated the ecclesiastical and bourgeois areas from the artisan quarter. And in a way it still does. To the north lie the cathedral and the banks; to the south, the university and the little bars and restaurants. I was enjoying my croissant when a lady arrived with the pungent pong of French perfume. My head began to ache and I had to leave. She wouldn't have been welcome at the Victoria Choral Society. I walked down to the Loire between a church and a stone wall with a magnificent wisteria vine. I was almost swept away by a scramble of students, not creeping like snail, but hurrying quite willingly to their Catholic lycée. What it must do to their spirit to live and work in such beauty! Wordsworth wrote of the part played by nature in the formation of his character. The same is surely true of the architectural environment. Happily, for these students in this institution, there was no longer any fear. This was not a cultural visit. I gave the museum a miss, and after the cathedral, spent most of the day strolling around the vieux quartier and enjoying the ambience. On a rooftop, pigeons were huddling together for warmth. A little child toddled towards me on the cobbled street. A street musician plucked at his guitar. Between the multi-coloured, half-timbered houses, I caught a glimpse of the cathedral spires. 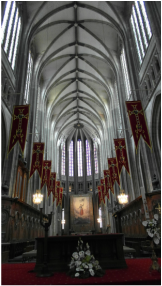 The cathedral is magnificent, of course, gothic, with a long nave, and a choir almost as long, presided over by a painting of Jeanne d'Arc. I was almost alone on both my visits. The burning of Joan of Arc at the stake by the English was not their finest hour. It is recorded and remembered everywhere: what happened and who did it! I wore my hearing aids today for the first time. I hadn't needed them when I was walking and talking to myself, and they wouldn't have worked in the wind anyway. Suddenly, the world was much louder. The booming of the church bells shook me to my very core, and the clanging of the bell of a tram coming up behind me made me stumble into a flower bed. For the next few days, I will be walking along the bank of the Loire. I will let the pictures speak for themselves.